Donald Trump can’t wait to build border walls between the U.S. and Mexico. He wants to spend $5 billion, and recently said he’s prepared to shut down the government to force Congress to approve the cost. Walling off the border will help prevent immigrants from taking American workers’ jobs and lowering their wages, anti-immigration advocates argue. But research shows that economic losses are greater when those workers are kept out. Researchers at Stanford University and Dartmouth College just released a detailed analysis of the return on investment of border barriers. The calculated benefits, published by the National Bureau of Economic Research: Low-skill workers earn one cent in extra income for every 19 cents the government spends on walling off Mexico. 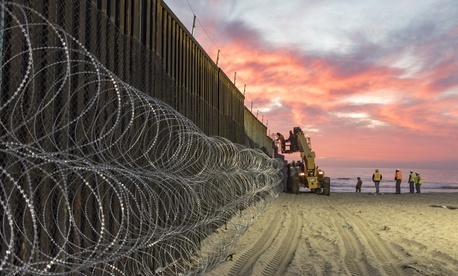 Their findings are based on an analysis of the effects of the Secure Fence Act of 2006, which provided funding to erect 548 miles of border barriers between 2007 and 2010 at a cost of $2.3 billion or $7 per person in the U.S. The fencing had the intended effect of curbing immigration, but barely improved salaries for low-skill workers. The economists calculate it reduced the number of Mexican workers in the U.S. by 82,647; incomes for the low-skill workers on the American side inched up by 36 cents a year. Overall, reducing Mexican workers cost the U.S. economy $2.5 billion—or $30,000 per missing Mexican worker. Mexico, meanwhile, saw a $1.2 billion GDP thanks to the workers it gained.